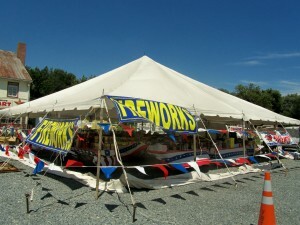 I wanted to get some pictures of a tent selling fireworks. 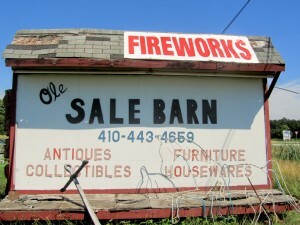 In Delaware, fireworks are illegal so you won’t find them. 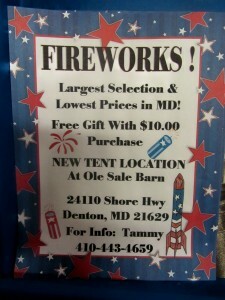 But, I remembered that around Denton, Maryland and on the way to the Chesapeak Bay Bridge, usually, they are present right before the 4th of July. My friend, Debbie, told me they were there so off I went yesterday. 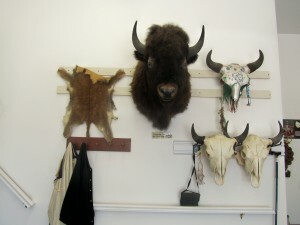 Right after the bison expedition. 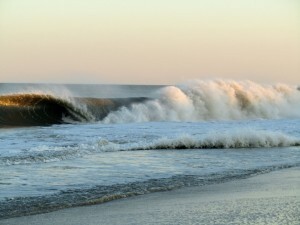 If you have come to the Delaware Beaches from the Baltimore/Washington area, then you must have taken Rt. 50. Then you also took Rt. 404 East. Right before the town of Denton, depending which way you are traveling you cannot miss all the “stuff” and I mean “stuff” out in front of a building. 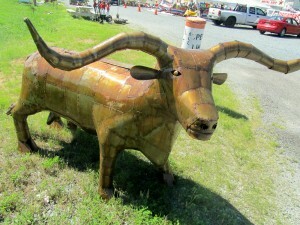 A lot of wrought iron and recyled metal art; signs, benches. Oh, my gosh, so much!! 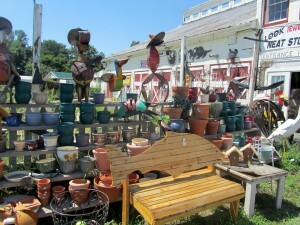 This is called Ole Sale Barn which specializes in all those things I mentioned and more; whimsical, and mythical cast iron, antiques, collectibles, and jewelry. 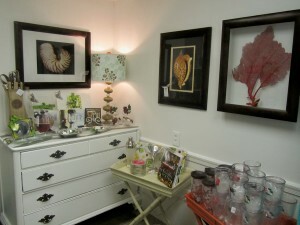 The address is 24110 Shore Highway, Denton, MD 21629. Tel. 410-443-4659. You can find them on Facebook. 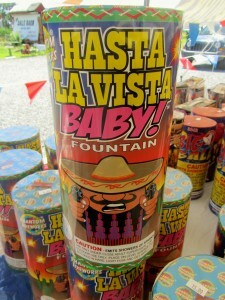 If you mention Facebook, a discount on fireworks will come your way. 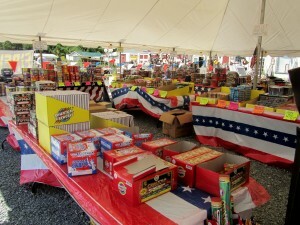 The tent was full of fireworks. Vic was in charge of the tent. He also owns the whole business. He told me to go inside the building since truckloads had come in. He was not kidding. I cannot even describe it. Just check some of the pictures and next time you are passing by, just stop in. It is very interesting and Vic and his family are very gracious. 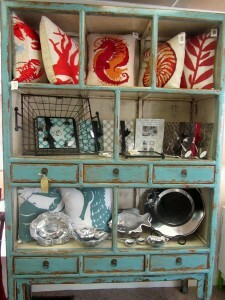 New recycled metal art had come in from craftmen in Mexico. There was so much I was overwhelmed. I loved the barbecue grill the best. As I came in I heard “Hi pretty girl”. 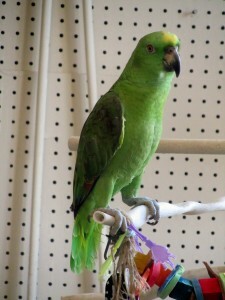 When I looked there was the parrot. She was only one year old and so cute. 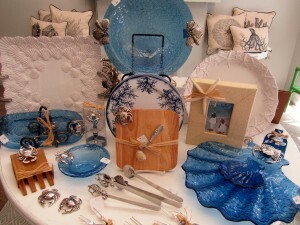 Check the pictures because the best shops for browsing and bargain hunting are piled high with a huge variety of items. This was one of them. 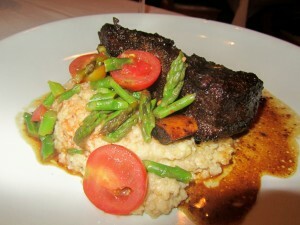 My interest in going to this farm this year was when I first had dinner at Eden Restaurant, located on Baltimore Ave. in Rehoboth Beach and they served us a tender, juicy, flavorful buffalo short rib. In my mind and definitely not wanting to be out of sight; I took off from Rehoboth towards Greenwood, Delaware. It was a bit of a drive but on a gorgeous day time flew by. Going through the country side of Delaware is really beautiful. I wrote a post on Colvin Farm last August 6th. 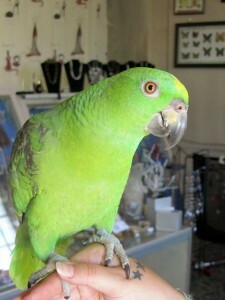 But, this time I went in and met one of the owners. I was a customer now. 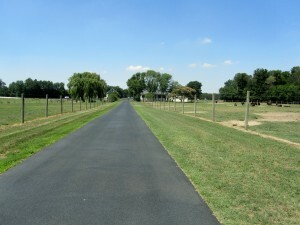 Located outside of Greenwood, in Southern Delaware, the setting is rural, woods and pasture. Depending which way you are traveling on Rt. 16, it is either after or right before Greenwood. This is a beach traffic route if you are coming or going to Washington, Annapolis, Baltimore, etc. etc. From Rt. 50 to the beaches, take 404 East and turn left after Denton, MD, on Rt. 16 East. From Rehoboth, Dewey Beach and Lewes take Rt. 1 North, then take Rt. 16 West and follow it through. There is not a time I go by that farm that I don’t check them out, looking for those calves. These babies are so cute; different from their massive parents. 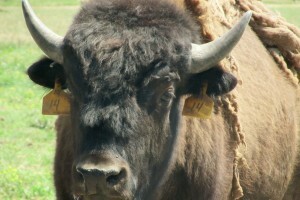 A mature bison bull weighs about 2,000 pounds and a bison cow approximately 1,100 pounds. They can run up to 30 miles per hour. Buffalo vs. Bison? 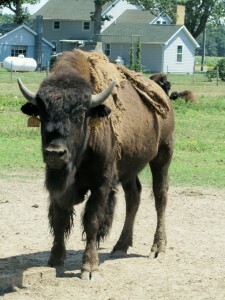 In North America it is bison; accepted as “buffalo”, as well. There are about 500,000 in this country. 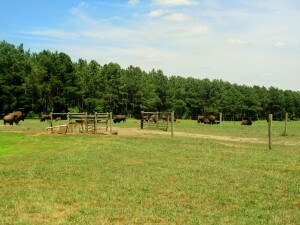 Colvin Farm has 100 acres and about 85 bison. 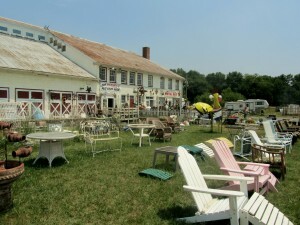 The address is 10685 Buffalo Rd., Greenwood, De 19950. Tel. 302-349-5334. E-mail address is bcbison@aol.com. Website? 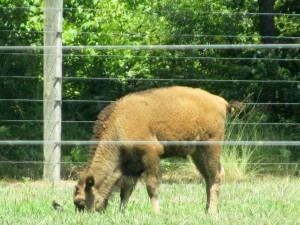 www.delawarebison.com. Even though I popped in, the best way to do it would be calling ahead. This farm is also their home and they are always in and out. But, they were home. Up went the garage door and that was where I did my shopping. I met Mrs. Colins and immediately we started chatting. She told me that the best way to cook the bison is “low and slow”. The steaks, patties, or anything you would be grilling should be cooked rare. 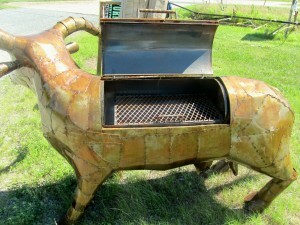 To over grill it would be making it tough. 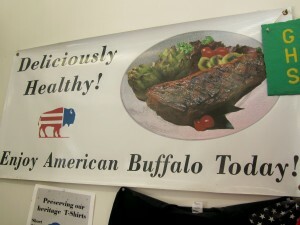 Bison is tender, flavorful; not gamey. Less fat and lower in cholesterol. 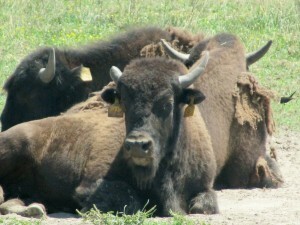 The combination of all those things is what is making bison at restaurants so popular. 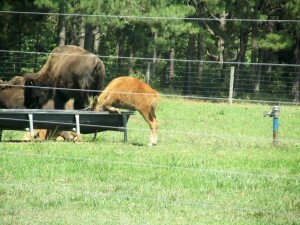 If you are eating bison at the Delaware Beaches, it is probably coming from Colvin Farm. The coat hangers in the garage were interesting. Don’t you think? Not everyone has those. I kept staring at them. Mrs. Collins told me I could take pictures. She and I were outside. She was throwing corn husks over the fence. 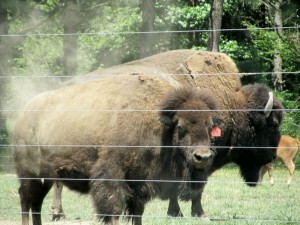 The bison were relaxing; but watchful. They are powerful and protective animals especially when they are near the calves. Mrs. Collins told me to drive to the back of the farm where the calves were. I was getting close to the fence when a few started dusting themselves. It showed in the picture. Hmmm….better stay back. Anyway, it was fun checking this farm out. I came out with short ribs, ribeyes, patties, and N.Y. strips. 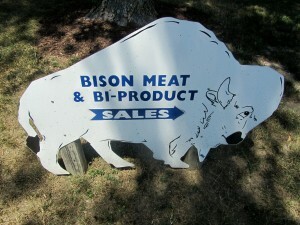 The Colvin Farm is proud that the bison in their farm are raised naturally, free of drugs, and no growth hormones. They ship everywhere in the country and to Europe, South and Central America. 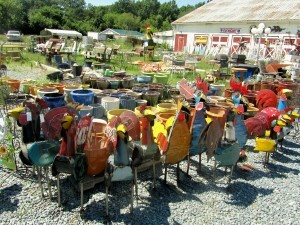 It is a beautiful day in the Delmarva Peninsula….enjoy it!! Not such luck. My friends thought that Sunday was a day of rest. No pictures. Just let me start my appetizer and dinner without the warning: Don’t Touch Anything Yet. That’s why they are such good friends, including my husband. Our choice for Sunday was Eden. 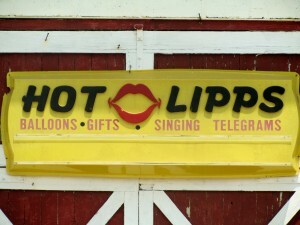 Located right on trendy Baltimore Ave. Address: 23 Baltimore Ave., Tel. 302-227-3330. Website? 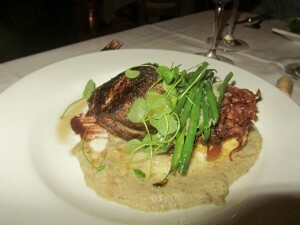 www.edenrestaurant.com. By the way we were celebrating a birthday, as well. This is my second time at Eden on this 2011 Season. The beaches are getting crowded and parking can be testing, at times. All that is worth it. Eden is top notch. In case you like to sit outdoors, there are also a few tables available in front of the restaurant. As you enter Eden, the bar is on the left. 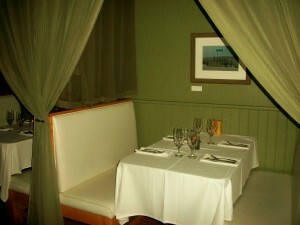 Then, individual tables are available, as well as booths. The restaurant is very well appointed and if the atmosphere they were trying to achieve was romantic, classic with an elegant understatement, then they definitely attained it. Evan introduced himself and I decided to go with his suggestions. I will have to tell you that we complimented him on how well he took care of us. This is his first season at Eden. If you make a reservation ask for him. He was really great. Appetizers: We decided on the Main Lobster/Local Crab Tower. It had a mango salsa and avocado puree. 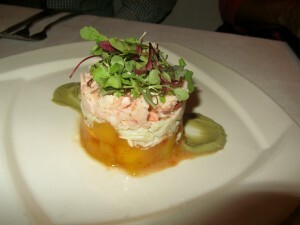 It was a signature appetizer and the presentation and combination of the lobster, avocado and mango was very good. 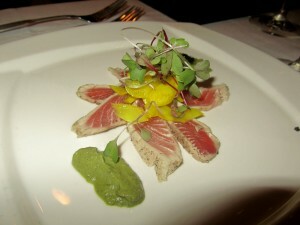 My husband ordered the Citrus Cured Ahi Tuna. It had pickled fennel and carrots and a caper pesto. He said it was delicious. 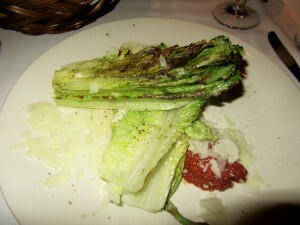 I love a grilled Caesar and Eden has a very good one with sun dried tomato/olive tapenade, pecorino romano, classic dressing. I cut it all up and mixed it. Really really good. Great flavor. My husband requested for his dinner the Herb Roasted Filet Mignon. It had a celeriac/potato, gruyere gratin, asparagus, sun choke puree, vidalia onion compote, blueberry/red wine/chocolate reduction. Tender, and rare like he likes it. Could not stop raving about the gratin made out of celeriac, potato and gruyere. The rest of us ordered the same thing. Evan told us that if we ordered the tuna we would be in for the best tasting tuna we would ever eat. Boy, was he right!! 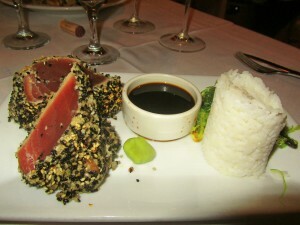 It was a wasabi/sesame crusted #1 Ahi Tuna. It came with sticky rice, seaweed salad, wasabi and soy sauce. Black and sesame seeds encrusted the tuna. You had to eat it rare, of course. It melted in your mouth. That’s all I need to say. Two sweet endings!! It was a birthday celebration. 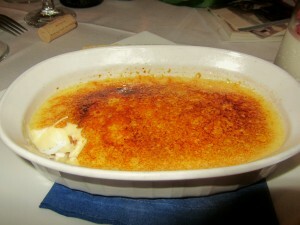 Nothing like a Classic Creme Brulee with housemade biscotti. 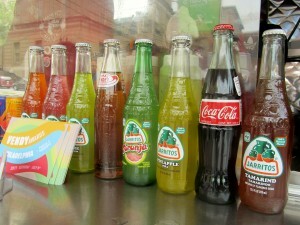 Traditional, that’s how I like it; forget those other fancy flavors. Lightly caramelized, as well. The biscotti? Perfectly baked; a welcomed softness. The featured dessert was the Panna Cotta. Pretty much a custard, as well. It’s origin? Northern Italian. Also eaten all over the country. It is made by simmering together cream, milk and sugar, then mixing gelatin in and letting it cool until set. 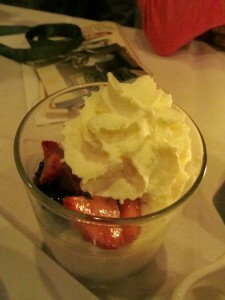 Ours was topped with fresh fruit and cream. Eden opens at 6 for dinner and reservations are recommended. I love Sunday evenings….never did when I was younger…I like them even better when I share the meal with friends; light conversation and lots of laughs. Pretty nice, isn’t it? How lucky! 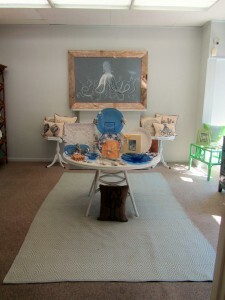 It is so easy for me to promote Rehoboth Beach. This coastal town in the Mid-Atlantic states is a destination, not only for the summer; it is a year round resort. I must admit, it might be a little quiet for a couple of months in January and February but other than those 2 months, Rehoboth Beach is a vibrant and friendly community. The town and its residents doing so much to keep it the charming town that it is. 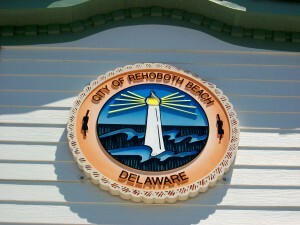 The town of Rehoboth Beach is one square mile. It is a walking town. 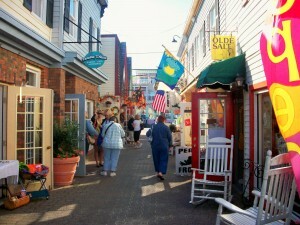 Stroll the tree-lined streets, enjoy the restaurants, shops and the boardwalk. 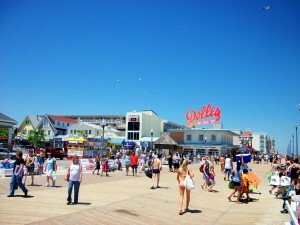 The Rehoboth Beach Boardwalk is parallel to the beach. In the morning walkers are exercising; it is one mile each way. Breathing that salt air early in the morning gets you in the mood for whatever the day has to offer. In the evenings the Boardwalk Bandstand offers entertainment. 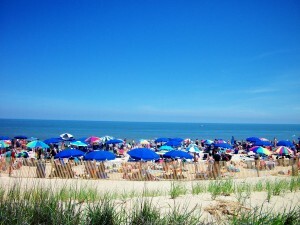 Sitting on the beach on a hot summer day is priceless and Rehoboth has a nice long and wide beach. When VacationRentals.com contacted me about advertising on my website, I felt comfortable. This is my hometown. 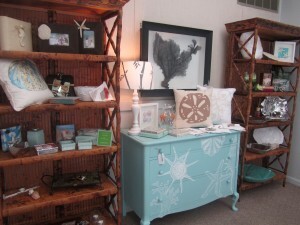 I find that Rehoboth has everything to offer for a great summer vacation. The town is within a few hours of our Nation’s Capital, Baltimore, and Philadelphia. Four hours from New York City. You can drive from those cities and be at the beach in no time. 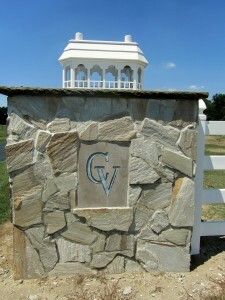 VacationRentals.com is a company with direct access to rentals in Rehoboth Beach. 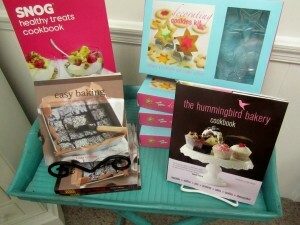 Plenty to pick and choose with different prices to accommodate each budget. At times, people want to just come for a few days; maybe a week or two for that matter. Other times there is a wedding in town. The preference might be a house, a condo or a townhouse so that guests can feel at home. A girls’ get-a-way-week-end or a guys’ golf get-a-way, as well. 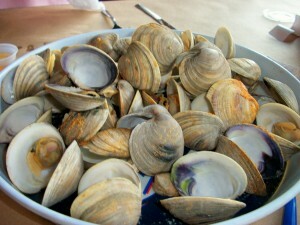 In my posts I talk about the seafood this area has to offer. 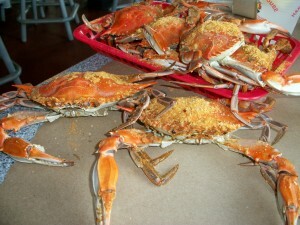 Crabs, clams, corn and plenty of other Boardwalk grub. You’ll have to get here and experience it; see what I am talking about. 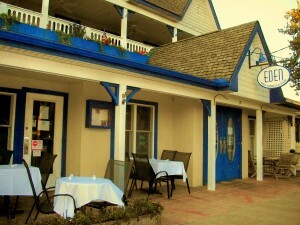 To access VacationRentals.com Rehoboth rental market please visit http://www.vacationrentals.com/vacation-rentals/Rehoboth-Beach-Delaware.html. They are under the Links on http://www.aboutmybeaches.com, as well. Just click on their banner and you are in their site. Easy. VacationRentals.com is part of HomeAway.com, the world’s most trusted vacation rental website. You can find them of Facebook and Twitter. Have a great day!!! 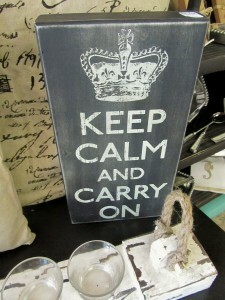 You are at the Beach…relax and kick back…. The very first time I wrote about TaDa I mentioned that it was the effort of a mother and daughter team, Blair Elizabeth and her mother, Patty. 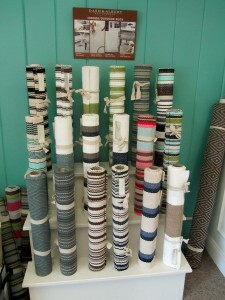 I was so surprised to see that the sister store to TaDa, called TaDa Home it really is a family affair. Father; Steve, mother; Patty, sisters; Blair and Brooke. 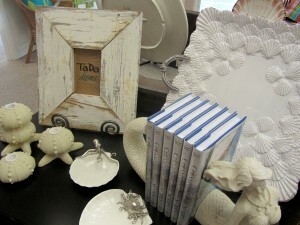 Their combined artistic talents is what is making TaDa Home a must stop shop in Berlin, Maryland. Berlin is located 7 miles from Ocean City. This historic town dates back to the 1790’s. I used to be in Berlin every day for so many years. I think my car still knows the route. And, there I was. Showing my cousin, Rosalyn, a most unique town. 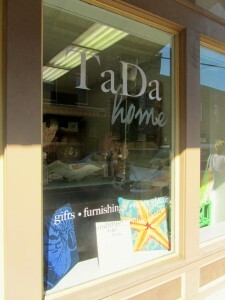 TaDa Home is located at 27 N. Main Street, Berlin, MD. Tel. 410-641-4430. Websites? 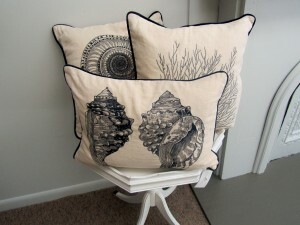 http://www.blairelizabeth.com and www.shoptada.com. I was so happy to see Brooke at the store. She immediately started showing us around. So proud that she has had a hand on the development of this shop. 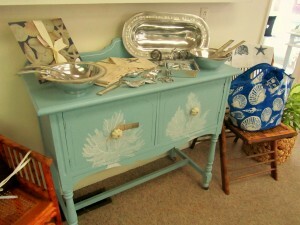 TaDa Home has furniture that is beautifully painted by Patty. 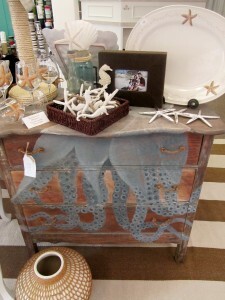 Patty is an accomplished artist in her own right and her touches make this furniture come alive. 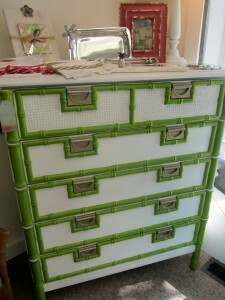 You see, some of this furniture is getting a second chance. Brooke and Steve have been combing the country side; picking just the right piece or the right wood. 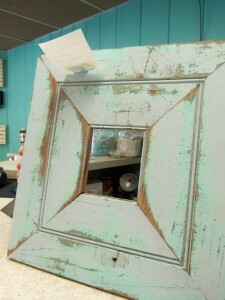 Some of the antique woods on the frames could be from an old barn. 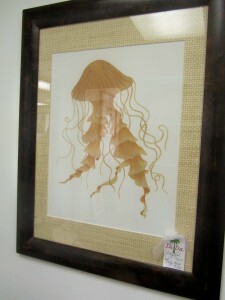 They have been able to salvage them and frame some of Patty’s artwork. 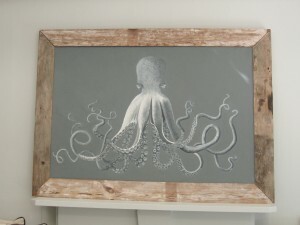 Others are made into frames and are also for sale. 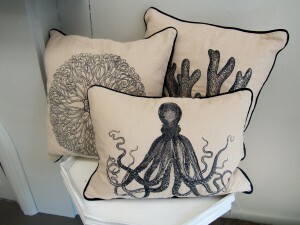 The day I visited an octupus motif was in some of the art, furniture and pillows. 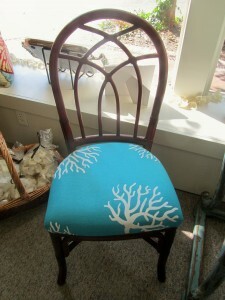 The furniture is beautifully restored. The hardware so pretty. 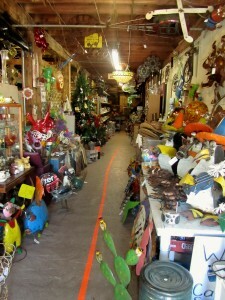 The store is very open and you can move around easily. 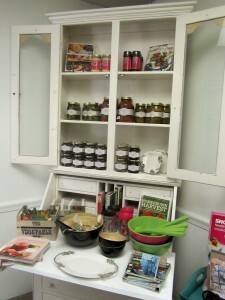 A section for jellies, jams and marinades, along with epicurian books. 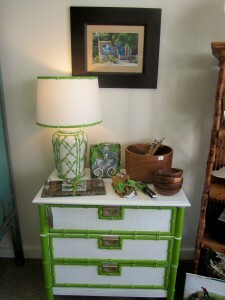 So many of the details that make this store are so personal to this family. 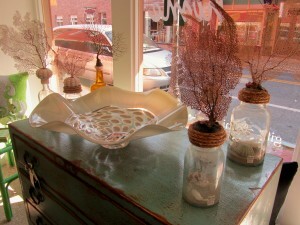 Brooke showed the glass vases that can add to any room of your house. 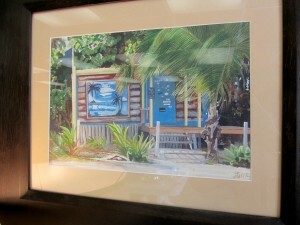 The watercolor from Rincon painted by Patty. A favorite town of the family in Puerto Rico. I took so many pictures. Everything looked so nice and the perfect shop to find gifs for any occasion. I noticed a frame with the name TaDa on it; just under the table. I think you might be interested to know what it said. TaDa Home is proud to support The Stephen Falck Foundation for MSA Research. Multiple System Atrophy (MSA) is a progressive neurodegenerative disorder that is currently without treatment or cure. It is their hope that by funding research for this illness they may help those currently suffering; and provide hope in the future for a cure. A portion of every sale from TaDa Home will be donated to MSA in honor of Steve Falck, the girls’ father, Patty’s husband, and everyone’s friend. 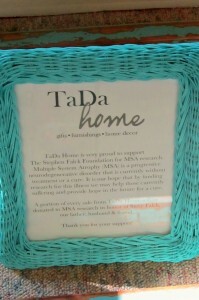 They thank all of you that shop at TaDa Home for the support. Note: Two websites that describe MSA well are www.wemove.org/msa/ and www.en.wikipedia.org/wiki/multiple_system_atrophy. 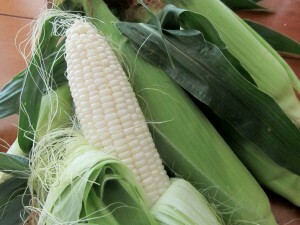 White Corn, Freeman’s Corn, 2011 Summer’s Bounty, Delaware Beaches, It is Here!! I got a text message telling me that Freeman’s corn was in. Out the door, in the car and off to the corner of Robinsonville and Plantation Rds. This road is Rt. 1D, which is parallel to Rt. 1. From a distance I spotted the white tent. As I got out of the car a lady said “it is a fine day when we see this tent go up”. I couldn’t agree more. 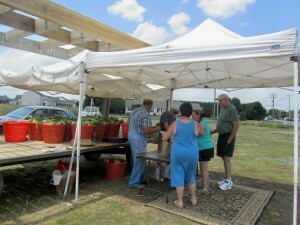 The tent protects the workers and the corn from the sun and heat. They even had their oriental rug on the ground. Those orange bins were full to capacity with corn. They had the white and the white and yellow combined. I favor the white. First thing they asked was if I was sending corn to Puerto Rico this year. That was an expensive package. I don’t know. These guys are so friendly. 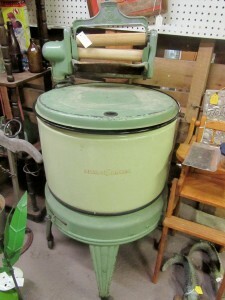 Freeman’s is a family owned business. All produce was just picked. 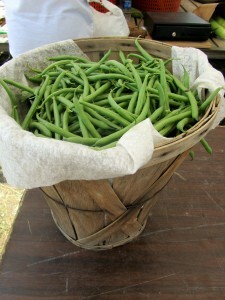 The green beans were beautiful; tender and sweet. 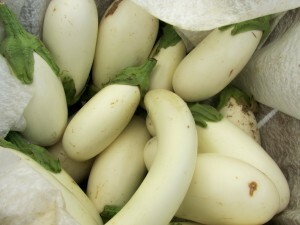 The white eggplant, which I only saw for the first time last year, was back. Sweeter than the regular eggplant; a thicker skin. Tomorrow might bring tomatoes to the tent. I love making conversation with the people in line. 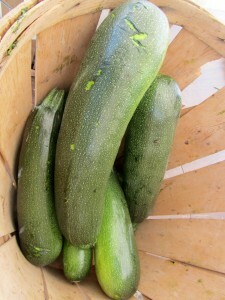 Yes, summer is definitely here, and 2011 summer’s bounty has made its entrance. Note: The first thing I did when I got home was peel one corn and take a bite from it raw. It was so sweet; priceless. 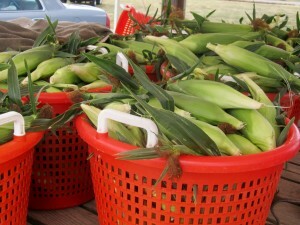 Comments Off on White Corn, Freeman’s Corn, 2011 Summer’s Bounty, Delaware Beaches, It is Here!! Tacos Don Memo, Authentic Mexican Food, Food Trucks, Food Truck Grub, Review, Philadelphia…Did you Think I was leaving the City of Brotherly Love without checking the Food Trucks? I don’t think so. 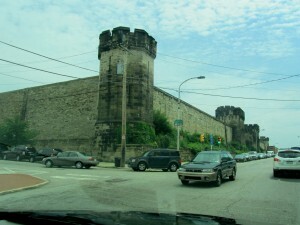 Getting hungry, is what I told Michael as we finished checking the Eastern State Penitentiary. We had a target Food Truck in mind; Don Memo. 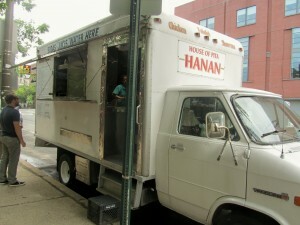 Michael had found it; it has been the Food Truck talk of the town for years now. A food truck craze, it seems. I know there were always food trucks coming to work sites. Now, they are all over the place. 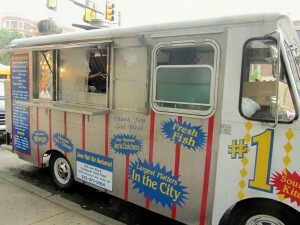 In Philadelphia, the food trucks are diverse; just like the City. As with anything, some food trucks are better than others, some more gourmet and some specializing in different types of foods including desserts. I love street food and eat it with total abandon. 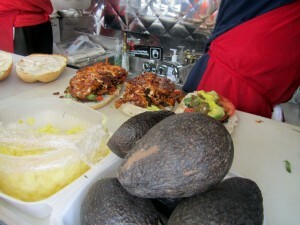 In Puerto Rico, food carts are a way of life. That’s where I grew up. Starting with my piraguas, or snow cones, to alcapurrias, churros, tacos de jueyes, piononos, etc….I still remember the kiosks in Luquillo Beach. It was lunch time. 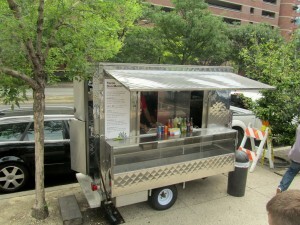 Tacos Don Memo is located at 38th Street between Walnut and Sansom. Right behind the University of Pennsylvania. Tel. 610-529-2039. Website? 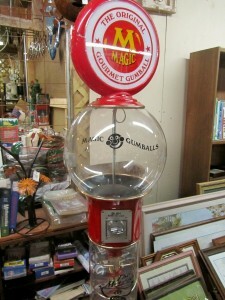 www.donmemophilly.com. There were several food trucks there, but I understand that during the school year there are even more. Don Memo had a line. It happens every single day. You can call your order in. Otherwise, be prepare to wait. First of all, everything is prepared to order. You can’t rush food, you know that. 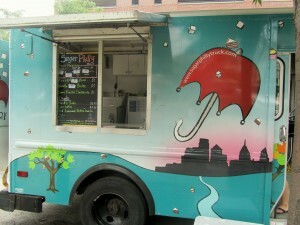 Food Trucks are an evolution from the traditional food cart. Actually, I found that Don Memo’s was more like a cart. It was small but immaculate. I am not kidding. We were all anxiously waiting. Leo Saavedra is the grandson of Don Memo. Him and the other gentleman did all the cooking. It was time to use my Spanish. Oh, well, by the time our food was ready they knew I was, originally, from PR and that Michael would be stopping by again and again. Michael was mortified. 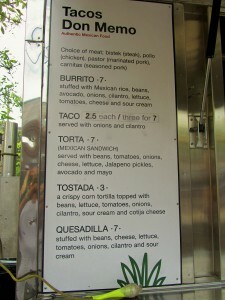 There was a menu on the truck. 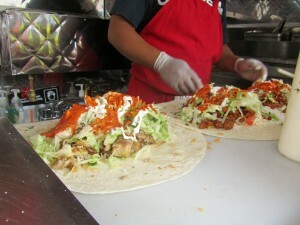 Customers had a choice of meat: bistek (steak), pollo (chicken), pastor (marinated pork) and carnitas (seasoned pork). It seemed that the pastor was the most popular one. When we arrived Leo was putting together some burritos. They looked gigantic. Then he was ready to fold them. Wait until you see mine. I almost got a Torta. This is a Mexican Sandwich. The roll is almost like the one from a sub. You start with your choice of meat and then they will add mayo, beans, tomatoes, queso fresco, lettuce, jalapenos, onions, pickles and fresh sliced avocado. What they called a Tostada was a puffy taco. The customers waiting were ordering mostly tacos and burritos. Michael got 3 Pastor (marinated pork) Tacos. The taco shells were doubled; made out of corn flour. Tomatoes, onions, a fair amount of heat and packing a lot of flavor. The diced crispy pork was very very good. I ordered the Burrito. This was an education; Burrito 101. It was so big. I also got the Pastor choice of meat. 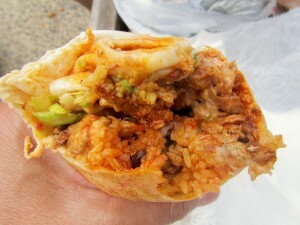 Then it was stuffed with Mexican rice, beans, avocado, onions, cilantro, lettuce, tomatoes, cheese and sour cream. Heat? Of course. He was surprised. He said the Puerto Ricans that have come to eat there did not want any hot sauce. Are you kidding? I could not belive that. 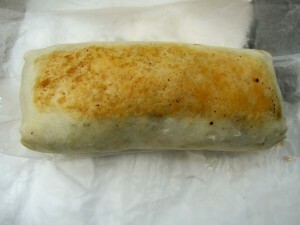 This burrito. Take a look. Was so perfectly folded. I could have thrown it up in the air and it would have stayed intact. The inside was so good; great combination. Loved the cilantro and the freshness of the ingredients. We sat on a bench on the street and ate it all before my brain started to register; about to tell me that food coma was next. After we finished we took a walk back to the car, but not before checking a few of the other trucks on that street. 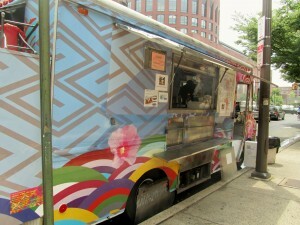 The Sugar Philly Truck had French macaroons, which were already sold out. Apparently, very popular. It also had chocolate molten cake, pineapple custard, creme fraiche cheesecake and even creme brulee. The majority of the trucks cook everything on site. This particular truck fixes the desserts at a different location and bring them in. Their website is www.sugarphillytruck.com. There was the house of Pita. 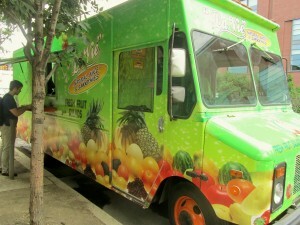 And, the Caribbean Soul Food truck. 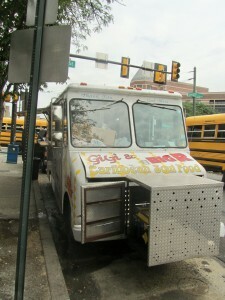 We saw other street food bounty trucks by Drexel University, as well. But, they would have to wait for another time. For all food truck aficionados there is a website; http://www.mobimunch.com, where you can find food trucks all over the country. 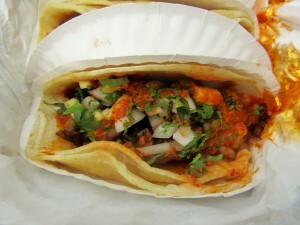 Note: Tacos Don Memo has a restaurant located at 57 Garrett Rd., Upper Darby, PA 19082. Tel. 610-352-2376. 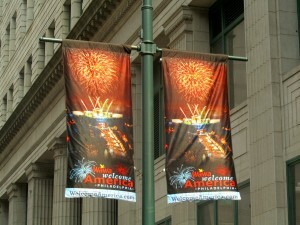 FYI: If you are in Philadelphia, please check www.wawawelcomeamerica.com. 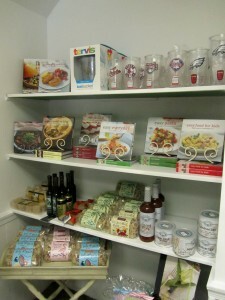 Going on at the present time; festival, showcasing “The Taste of Philadelphia”. Fireworks will be at Penn’s Landing and the concert with The Roots as the headliners will be at Benjamin Franklin Parkway. Info is on that website so check it out. On my way to the food trucks I stopped by just to get info. 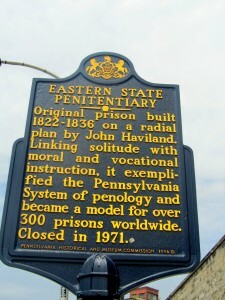 on this historic penitentiary. All the prison shows on t.v. do not compare to how massive and impressive this prison is. Built in 1822-1836, it was then closed in 1971. Now, it is the site for tours, reenactments and special events. Today, Saturday and tomorrow, Sunday is the only time that they offer the Behind the Scenes Tour: Death Row. 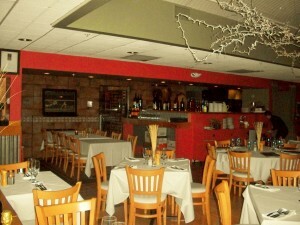 You will need to make a reservation online. Tours are limited, though. Please visit www.eaternstate.org. 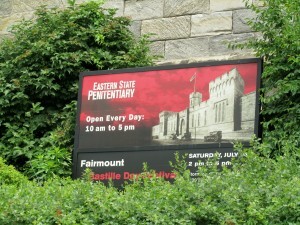 Eastern State Penitentiary is located at 2027 Fairmount Ave., Philadelphia, PA 19130. Tel. 215-236-3300. It was once the most famous and expensive prison in the world; also the first true penitentiary. It was designed to inspire penitence, or true regret in the hearts of convicts. Eastern State Penitentiary was once the home for Al Capon. It is open every day from 10 a.m. to 5 p.m. Last entry at 4 p.m.
Saturday, 7/16 – Bastille Day – At 2:00 p.m. the Street Festival will start. Then, at 5:30 p.m. a Reenactment will take place. This is one of Philadelphia’s most popular summertime events. Join them for a playful reenactment of the Storming of the Bastille and a French-themed Street Party. Later on September 23rd until November 5th and on Selected Evenings — Terror Behind the Walls. This is a massive haunted house inside a real prison. Called “Perfect for Halloween” by the New York Times and ranked the No. 1 Haunted House in America by AOL City Guide. 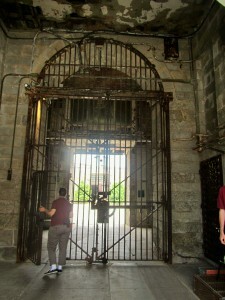 Eastern State Penitentiary offers hour-long tours led by an expert tour guide. This tour highlights its 142-year history. Other tours are what they call “Hands-On History”. 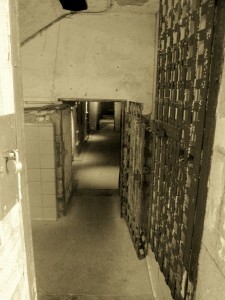 They are a series of short interactive experiences (about 5 minutes each) throughout the penitentiary. If you decide to take advantage of any of these tours, then, get hungry, go across the street to Jack’s Firehouse, at 2130 Fairmount Ave. Tel. 215-232-9000. Website? www.jacksfirehouse.com. It is located inside a 19th century firehouse and it looked very interesting. Could not visit this time, but on my list for the next road trip to Philly. Have a good one…talk to you later….